As many cities move to upgrade street lights with more efficient LEDs, residents of Berlin are digging in their heels over a plan to replace their atmospheric gas lanterns. We have noted the swelling ranks of cities and towns in the process of swapping out their less efficient, maintenance-heavy HID street lights for LEDs -- with Los Angeles being the poster child for the movement. Besides reducing carbon emissions, the cities are projecting that energy savings will pay for the upgrade to LED lighting in 10 years, seven years, or even five years. As prices for LED products continue to fall, the numbers are starting to get pretty compelling. Most of the resistance to LED street light projects that we have reported on has been based on citizens' dislike of the light the new fixtures produce. Some people say the LEDs are too bright, too cold, the light too invasive of darkened bedrooms. Now, The Atlantic Cities reports on another source of discontent with LED modernization in Berlin: resistance to the loss of a beloved historical artifact, in a city that has lost too many of the physical markers of its history already. Feargus O'Sullivan writes that Berlin is home to more than half of the gas lanterns still in existence anywhere in the world: 43,000 of them. They give off a warm, yellowish (and dim) light to which residents have become understandably attached. 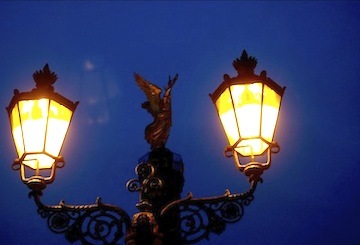 More than 20,000 Berlin residents have signed a petition demanding that the gas lamps stay. There is a Berlin Gas Lamp Association involved in the fight to keep the historic lights in place. The World Monuments Fund has placed Berlin's lamps on its 2014 list of endangered cultural artifacts. The Senate Department for Urban Development and Environment is trying hard to meet public objections. They have sponsored the design of masts and standards that match the old lights as closely as possible (Google translation). They have been at pains to make sure the spectral output of the LEDs matches that of the gas lamps as closely as technology allows. Still, opponents say the LEDs are not good enough. The city has reasons besides cost to want to install LEDs. New, adaptable street lights can be in important component of the "smart city" plans that Berlin has under way. And the argument that replacing the gas lamps will save money rings a bit hollow, as author O'Sullivan points out in The Atlantic Cities: "While Berlin is getting rid of surviving historic features such as the lamps on cost grounds, it's also recreating a new version of a long demolished monument -- its old castle -- at a cost of €590 million." If I had to handicap this race, I would guess that the gas lamp proponents have a good chance of derailing the LED upgrade plans. Values other than money and efficiency may prevail in Berlin, for now.